Multitester tested for voltage. This is an ORIGINAL factory Genuine HP brandAC input: 100-240V and DC output: +32V 1560mA. Triple round barrel PURPLE connector. 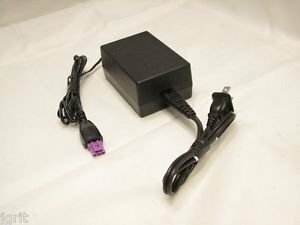 Hewlett Packard adaptor, adapter, transformer, powersupply, power supply, iscompatible forthe following (and others): HP DESKJET 6980 COLOR INKJET PRINTER C8969A, C8969AR, C8969B, C8969BR HP DESKJET 6983 COLOR INKJET PRINTER C8969C HP DESKJET 6940 COLOR INKJET PRINTER C8970A, C8970AR HP Deskjet 6980dt Color Inkjet Printer C8972A HP PHOTOSMART D7360 PRINTER Q7058A, Q7058AR, Q7058B, Q7058BR, Q7058C, Q7059A HP PHOTOSMART D7355 PRINTER Q7060A S&H in the contiguous USA is $6. (insured shipping).Please see other interesting products by JGritUSPS DELIVERY TIME: As stated in the item listing, seller will drop-off your item to the USPS within 4 days of receiving cleared payment. How long it takes to deliver to your door is strictlywithinUSPS control and not within the control of seller. Please leave 5 stars for seller 4 day drop-off time. Thankyou.